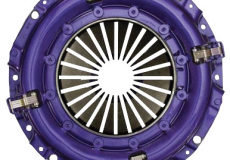 Diesel clutches were the first to experience Ace’s POWERFORCE technology. Currently offered for Powerstroke and Cummins applications, these are among the highest torque rated, single disc clutches. They all come with sprung hub discs to reduce damage on mating components. Each application, as in all POWERFORCE clutches, has been specifically designed to get the best performance at peak torque RPMs. Whether you are looking for a simple OE replacement or if you are doing extreme hauling and pulling, Ace Racing has a diesel clutch that will fit your needs.